In this letter to George W. Martin, George P. Morehouse discusses the "Fool Chiefs" of the Kaw tribe. 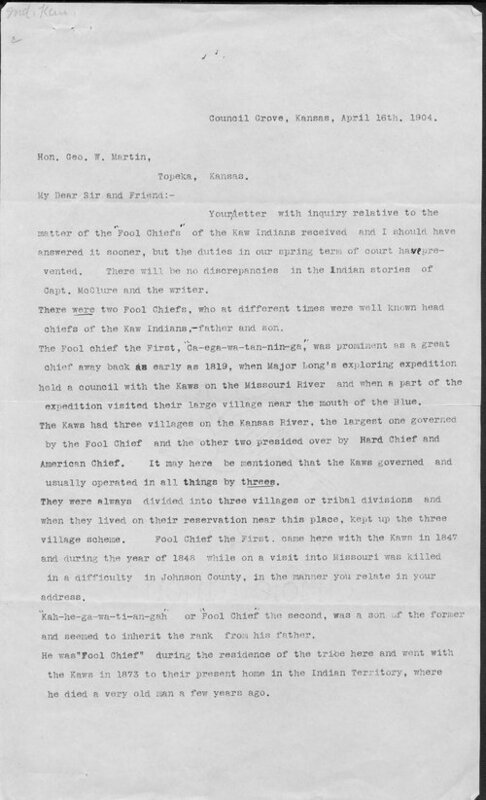 According to Morehouse, the two "Fool Chiefs" were well-known Kaw leaders who were father and son. Morehouse also mentions that the Kaws "governed and usually operated in all things by threes." Finally, Morehouse states that the title of "Fool Chief" was not an insult but something that "could only be maintained by brave and warlike qualities along with good conduct and wisdom in council."